Every year around this time, I get into a cranberry mood and generally don’t come out until spring when strawberries are in season again. 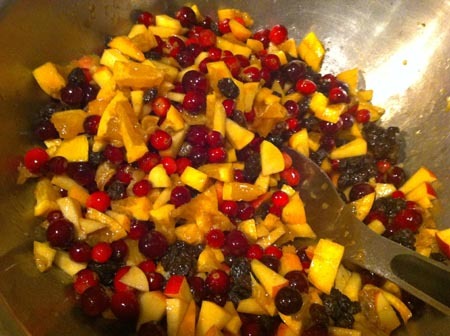 Cranberry-apple-orange relish is one of my favorite things to make, but this year’s cranberry relish has a different twist: it’s fermented. 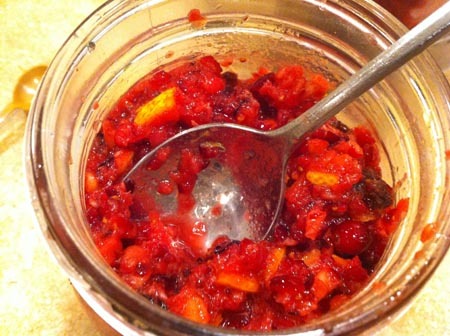 Now, you could just as well make this cranberry relish fresh, and skip the fermentation step altogether. It’s perfectly wonderful that way. 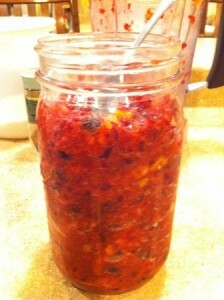 (Truth be told, it’s pure torture to seal this stuff in a jar and wait a full two days to eat it.) But make it fresh, and you’ll miss out on the beneficial bacteria that proliferates when you allow the relish to ferment at room temperature for a couple days. Whatever you decide to do, please don’t skip or skimp on the orange peel because cranberries and orange peel were just made to go together. Kefir Starter Culture can be used: Dissolve 1/2 package into 1/4 cup warm water. Fresh whey can be used as a starter for this recipe. Use 1/4 cup. Combine all of the ingredients in a large bowl. Then, transfer to the bowl of a food processor or Vita Mix and process to desired consistency. Serve, chill, or proceed to the fermentation step. If you opt to ferment this relish, place it into wide mouth mason jars, screw the caps on tight, and leave them on the counter for two days if your kitchen is warm-ish; a day or so longer if your kitchen is cool. Then transfer them to the fridge.